Discover the difference that premium swimwear can make! With a new swim costume that fits comfortably without limiting your range of motion, you’ll look great and give a flawless performance. Our swimwear features durable materials, precise fits and the latest features. Choose from a wide variety of styles for men, women and children. Buy Premium Swimwear from Swimmers Today! Whether you’re a casual swimmer or a competitive athlete, you’ll find the right swim costume for your specific needs at Swimmers.co.uk! We offer everything from flirty swimkinis to racing costumes that cut through the water like a razor’s edge. Outfit your entire family from our extensive selection of premium swimwear for men, women and children. Swimmers offers a complete line of kid’s swimwear that includes everything from bright swim costumes for your toddler to high-performance racing swimwear for your pre-teen who has his or her eye on Olympic gold! Surprise your up-and-coming champion with swimwear that looks and performs just like the costumes the pros wear. 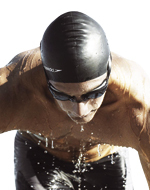 For the male swimmer, we offer basic swim shorts, training swimwear and racing gear from top names in the swim industry like Speedo, Keifer and Dow. Made from durable, fade-resistant materials and designed with performance in mind, our attractive line of men’s swimwear helps you reach peak speeds in the pool. Female athletes can also appreciate the wide variety of styles offered at Swimmers.co.uk. With a wide array of swim costumes that includes fun swimkinis, vibrant one-pieces, racing swimwear and attractive cover ups, you’ll look your best, train your hardest and compete at levels higher than you ever imagined. Find the Perfect Swimwear for Your Family Today!